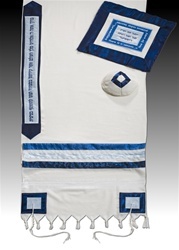 Argaman Royal Blue and Blue Striped Men's Talit 20"x80"
Argaman Men's Royal Blue and Blue Striped Talit 20"x80"
This stunning Tallit set is made of a soft Viscouse fabric with real silk stripes - shades of blue. The Tallit bag bears the following saying from King Solomon in Hebrew and English "For everything there is a season, time for every purpose under heaven". The Talit is made in Israel.